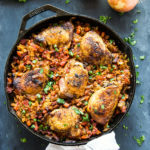 This One Pan Spanish-Style Chicken and Rice is a super easy weeknight meal that's packed with flavour! Make it spicy or family-friendly all in one skillet! On the stovetop, heat a large cast iron (or other oven-safe) skillet over medium high heat and add the chopped chorizo sausage. Brown the sausage until it's cooked through but still soft. Remove to a paper-towel lined plate, leaving the remaining fat in the pan. Season the chicken thighs on both sides with the paprika and salt and pepper, and place in the hot skillet skin-side down. Brown the chicken on both sides to create a dark golden brown crust, but don't worry about cooking the chicken through completely (it will finish cooking through in the oven later). Remove to a plate and set aside. Reduce the heat to medium and add the onion, bell pepper, and garlic to the hot skillet and saute until the vegetables are soft. Add the cumin, chili powder and garlic powder and stir to combine. Add the white wine and stir gently until the wine almost completely evaporates and there's only a small amount of liquid remaining. Add the cooked chorizo you set aside previously, along with the diced tomatoes, rice, and chicken stock, stirring well to combine. Nestle the chicken thighs into the rice mixture in the pan, skin-side up, ensuring that the top skin is sticking out of the liquid. Cover the pan with a lid or aluminum foil and place in the oven at 350 degrees Fahrenheit for approximately 20-25 minutes or until the rice has cooked completely and the chicken reaches an internal temperature of 165 degrees Fahrenheit (75 degrees Celsius). Remove the aluminum foil or lid for the last 5 minutes of baking to allow the chicken to crisp up slightly. Serve immediately with some freshly chopped parsley or cilantro, if desired.